A NEW Lucan school is putting digital first by integrating technology into the school curriculum. 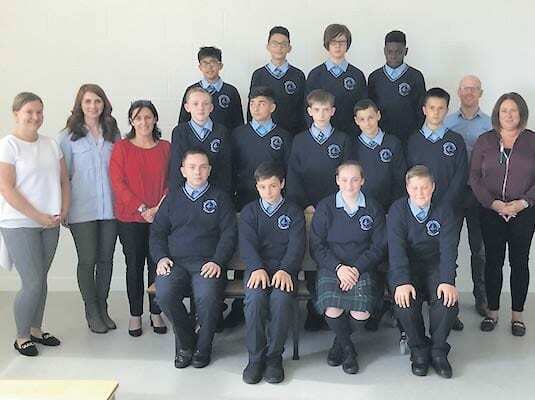 Griffeen Community College took in its first class this year and the first year students are using tablets and technology in tandem with traditional learning methods. Principal Rachel McGrath told The Gazette that the opening of a new school presented the ideal opportunity to use these methods. Ms McGrath said that the students love learning through technology but staff are conscious that there is a blend of new and traditional educational methods. “We are very conscious about screen time and they (the pupils) still have to understand literacy so that is also a very important aspect of what we do,” she said. Ms McGrath added that it was an exciting time for the school and she was committed to giving her pupils the best educational experience possible. “Our school motto is ‘learn with pride and progress with confidence’,” she said. The school is currently located in Kishoge Community College on the Ninth Lock Road in Lucan. The new school will move to a purpose-built, brand-new complex within the next two years. They are now enrolling for September 2018 and taking applications for 2019. For details and application forms please contact info@griffeencc.ie.